I double dare you to try reading the above and without singing it in your head! 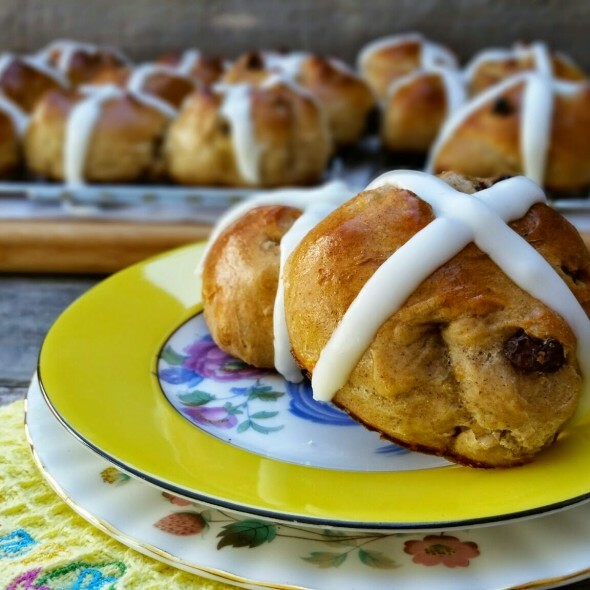 Most everyone has heard of Hot Cross Buns even if they have never tasted one in their life. Despite its introduction to millions of elementary school band students as one of the very first learned pieces of music, in actuality Hot Cross Buns is more than a tune laboriously learned and practiced in droning notes resulting in the surreptitious plugging of parent’s ears. 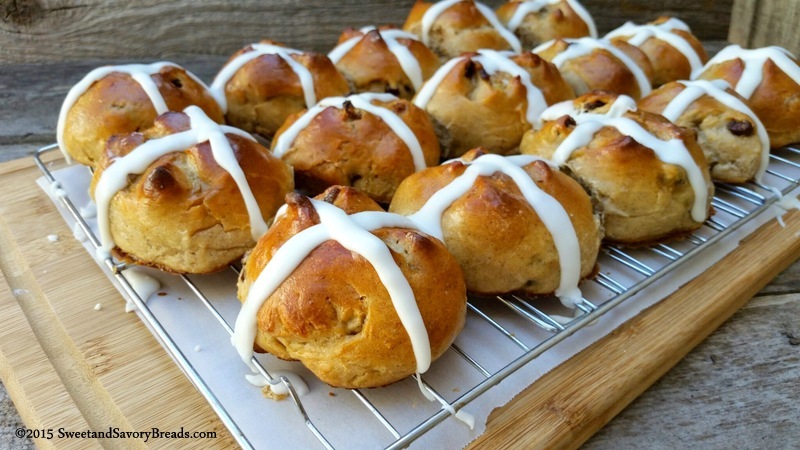 Hot Cross Buns in truth are a traditional sweet bread served on Good Friday to celebrate the end of Lent. These soft, rounded buns are made with yeast, flavored with spices and are sprinkled throughout with raisins, currants or other dried fruits and citrus peel. A cross shape is either cut in or painted with icing on the tops to represent the Cross of Christ. Whether you celebrate Easter, are looking to cement a friendship or just like yummy sweet bread, enjoy! 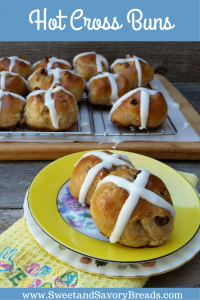 Hot Cross Buns are traditionally baked and served on Good Friday. Made with yeast, spiced and sprinkled throughout with dried fruit, the tops of these lightly sweet rolls are painted with white icing to represent the Cross of Christ. 3/4 cup warm milk 105-110 degrees F.
In a small bowl, pour 1/4 cup of the warm milk. Stir in 1 teaspoon granulated white sugar. Sprinkle the yeast over the milk and sugar mixture and allow to sit for 5-10 minutes until foamy. Allow a little more time if your kitchen runs to the cool side. (Note: The following instructions are for using an electric stand mixer and kneaded with a dough hook. If you do not plan to use a mixer you may easily use a wooden spoon for mixing and your hands for the kneading portion) In a large mixer bowl combine 3 cups of flour, salt, spices, and the remaining 1/4 cup granulated sugar until thoroughly mixed. Make a well in the center of the flour and pour in the foamy yeast milk. Add the butter, eggs and remaining 1/2 cup of warm milk. Mix on low speed until the flour is incorporated into the wet ingredients scraping down as necessary. The dough will be sticky. At this point, change to the dough hook and start kneading the dough at low speed gradually adding the remaining flour 1 Tablespoon at a time. Knead in each addition until incorporated before adding the next. Do this until the dough is no longer sticky. Remove the dough and form into a ball placing into a large oiled bowl and turning to coat. Cover with a clean towel and allow to rise in a warm spot for 2 hours or until doubled. After the dough has doubled in size, remove to a lightly floured surface. Pinch off 16 pieces of dough approximately the size of a ping pong ball and using hands shape into rounds pulling the sides down and pinching together underneath. Place each dough piece 1 and 1/2 inches apart on a baking sheet sprayed with non-stick spray. You may snip the tops in a crisscross with kitchen shears if desired. Cover with plastic wrap sprayed with non-stick spray or a clean towel and once again allow to rise in a warm place until doubled, approximately 30-40 minutes. Preheat oven to 400 degrees F. Beat egg and 1 Tablespoon milk together and brush tops and sides of dough using a brush. Bake 10-15 minutes until light brown and a toothpick inserted comes out dry. Allow to cool for a few minutes before removing to a wire rack. When the buns are completely cool paint the traditional cross pattern on the tops. Whisk together the milk and powdered sugar until thick, starting with 6 Tablespoons of powdered sugar and adding more as needed until the frosting is thick enough to pipe. Spoon into a plastic sandwich bag and snip off a small part of one corner. Pipe a frosting cross on the top of each bun. Posted in Breakfast Breads, Yeast BreadsTagged Easter, holiday, raisins, sweet, yeastBookmark the permalink.